A Luke Varney brace ended Leeds United’s run of seven games without victory as the Whites battled back from a goal down to claim all three points in the Yorkshire derby. Brian McDermott took charge of his first game as the new Leeds United boss and was greeted warmly by the Whites faithful. A worrying looking defensive line-up featuring three full-backs did little to dampen the mood in and around Elland Road, for this was the dawn of a new era, whether victorious today or not, McDermott’s press conference the day before this tie had won the fans over. For the first time in months, Leeds had cause for optimism. The first half was a poor one. Steve Morison fluffed an early chance for The Whites before the referee took control and ensured the game wouldn’t flow long enough for many more chances to be created. While Leeds probably got the better of the referees incessant need to blow his whistle, the constant stoppages made for poor viewing and did little to help either side apply pressure. 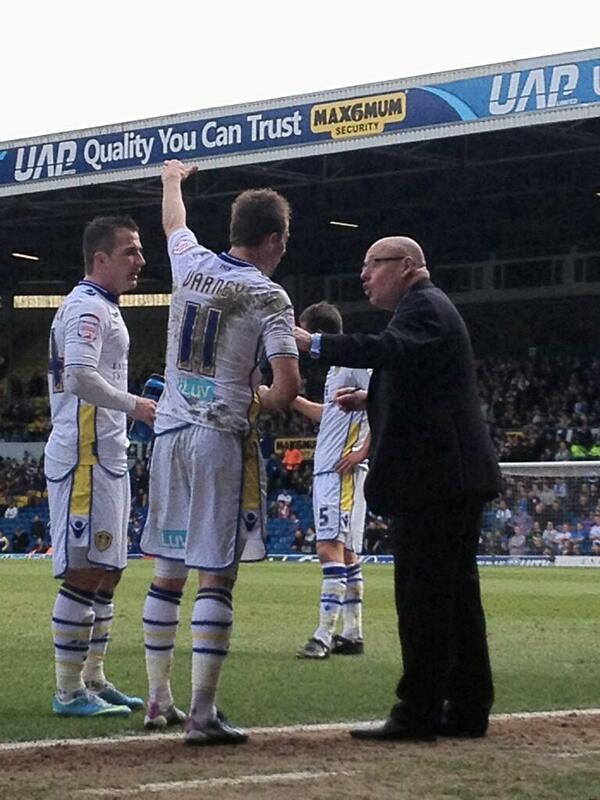 Down on the touchline, Brian McDermott was incredibly animated. At no point during the game did Leeds United’s new manager stop passing instructions and encouragement on to players while furiously taking notes on the team he’d inherited. For all McDermott’s encouragement and guidance however, Leeds United soon fell behind. A long hoof up-field from Chris Kirkland was headed onto Jermaine Johnson who chipped Paddy Kenny to give Sheffield Wednesday the lead. If McDermott was taking notes at this stage, they probably questioned the existence of a Leeds United defence. A scrappy half drew to a close with Leeds unlucky to be behind. Aside from Sheffield Wednesday’s goal, the only real chance of the half was a Football Bloopers-worthy fluff from Steve Morison. “Fine lines” as Neil Warnock would say, but they’re the same fine lines that have existed all season long – no width and little creativity. My half time tweet (above) may look a little insane with the benefit of hindsight, but the problem McDermott needed to address is contained within it. Luke Varney was the most useless player on the pitch for the first 45 minutes, clumsily bumping into people, lacking the ability to take anyone on and failing to deliver anything that resembled a decent cross. He’s NOT a winger. But Luke Varney has been played in this position for half of the season for one reason – because Warnock insisted he had the qualities to replace Robert Snodgrass before the season began and has stubbornly stuck to that ridiculous opinion ever since. I’ve maintained throughout the season that our squad is nowhere near as bad as Warnock was making them look, his biggest failing as a Leeds United manager was an inability to get the best out of the eleven men he fielded. Remember Lee Peltier at full-back for example? Warnock persisted with him in that position for months, despite the glaringly obvious fact he was useless there. When he was eventually forced to change things around and Peltier was switched to central defence, the result was astonishing. Peltier has been our best defender ever since. Ross McCormack is another example, probably the best player in the team but criminally under-utilised by Neil Warnock. But this was a new era. A new manager with fresh ideas, his eyes open to the problems we have. Dismiss it as the “new manager effect” if you please, these are after all, early days, but the substitution made by Brian McDermott at half-time changed everything. El Hadji-Diouf came on to replace David Norris. Leeds re-emerged a different team, one steadied by El-Hadji Diouf’s calm passing and composure, now visibly full of self-belief and looking to apply immediate pressure. Had it not been for another fluffed opportunity from Steve Morison, you’d have found it very easy to believe that McDermott had changed all eleven players. Unfortunately, no half-time words of wisdom were going to improve Steve Morison’s day. McDermott wasn’t to be beaten that easily though. Recognising the torrid time of things Morison is having, the new Leeds United manager made his second substitution, replacing Steve Morison with Aidy White and switching Luke Varney to centre forward. This turned out to be another stroke of genius. Within minutes of the formation change, El-Hadji Diouf linked up with Ross McCormack who delivered a cross from which Luke Varney headed home a brilliantly taken equaliser. He may be less of a winger than I am an astronaut, but Alan Shearer would have been impressed by his centre-forward play. Leeds had no intention of settling for a point and within six minutes of the first goal, the Whites took the lead. Once again Ross McCormack was to be the provider after Sheffield Wednesday failed to deal with his run and another cross was provided for Luke Varney to head home. 2-1 with both goals from Luke Varney. However optimistic we may have been before kick-off, no one saw this coming. In front with 20 minutes remaining, Leeds took their foot off the gas, seemingly happy to absorb pressure and allow Sheffield Wednesday to go in search of an equaliser. With what is a very dodgy defence at the best of times, one that today contained only one recognised central defender, this seemed a little suicidal and things got even worse when Stephen Warnock was injured leaving Rodolph Austin to fill in at centre-back. But despite a few nervy moments, Leeds held out. Rodolph Austin commanded the air like a World War 2 spitfire, heading clear several balls Sheffield Wednesday hit into the Leeds United penalty box searching for an equaliser. The third stroke of genius this afternoon you could argue. Brian McDermott said after the game that he and his players all have a point to prove. I wouldn’t say job done, but it was a good start. Congratulations must also go out to Neil Redfearn who, once again, was thrown in at the deep end and rightly shared in McDermott’s final whistle celebrations. You could make a case for a few players; Sam Byram was once again excellent, Ross McCormack created both of Luke Varney’s goals, Varney of course scored two, and while he’ll be criticised by some for a few wayward shots and passes, Rodolph Austin’s defensive contribution was vital to the three points. I mentioned his command of the air in the final 10 minutes of the game, but he made quite a few good challenges to break up play throughout the match. However, none of the players mentioned had the same impact as El-Hadji Diouf. His substitution brought with it a composure which led to everything else, he made himself available to receive passes, held the ball while people created space for themselves, ran at people to create space when he didn’t have an option – he just tied everything else together. I had my reservations, but if Neil Warnock did one thing right while he was at Elland Road, it was signing Diouf.